Does my jotform needs to be embedded in a website or can I just send a link to it? So, I will need about 156 users to fill out the form with their name, address, etc. and from a drop down menu be able to choose the numbered from approx. 250 pieces (100, 101, 102, etc) of art and email the form to me. I realize I will need an upgrade to have 156 people use this form and I see there are no cancellation penalties after 1-2 months of use. Correct? Does the form need to be attached to a website or can I email it to all 156 people? Now in regards to the sharing of the jotform. 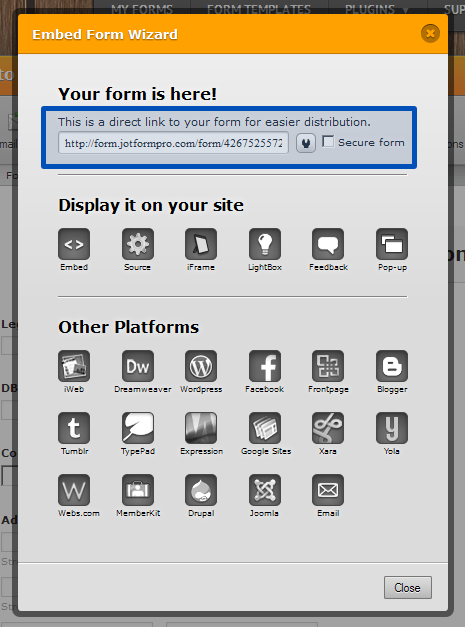 You can share your jotform by sending an email with a direct link to it which will show them your jotform in its own page, but you can also embed it in your website as well. You can get a link by clicking on the Embed option in the toolbar which will open a new window with the link. If you look at the bottom of it you will also see the Email button that would allow you to send the link to your jotform with more ease.